The Professional’s Technical Analysis Tool. Having been at the forefront of Market and Volume Profiling for many years Dan has been guiding trainees to successful careers using this tool as well as using it in his own trading. 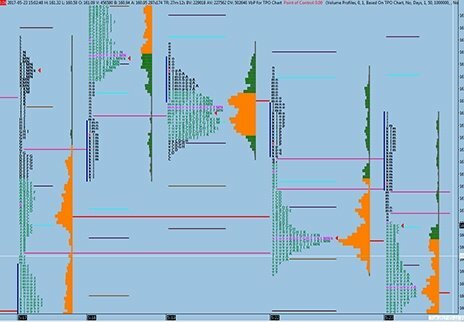 Market Profile gives you the edge in understanding market dynamics, who is in control of the market in terms of buyers and sellers and gives you key indications as to where value is set and where it may be likely to travel to next. Learn how to use this tool in your own trading. Follow the guide through the basics of Profile to Open and Day types as well as how to interpret it as the day progresses. Below is a summary of the modules you receive in this course. For me, why I chose the course was all about the credibility of the programme. This seemed to be a course with one very clear focus and that was to help people achieve profitability in the trading arena. From all of my university degrees and other courses I have done this one is by far the most practical and has the most application to my day to day goals.